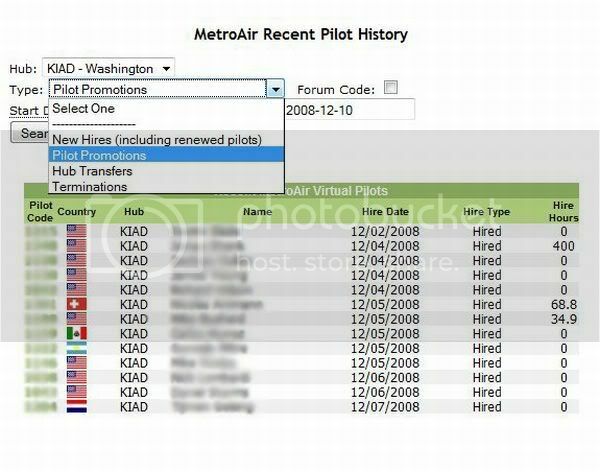 Today we continue our behind the scenes look at MetroAirâ€™s daily operations with a glimpse of my duties as Washington Hub Manager. There are two primary components to my job, approving PiREPs and being one of the main contacts for pilots at the airline. Iâ€™d like to take you on a tour of my virtual office. I have two main places that I work from, the Hub Manager Panel, similar to Alexâ€™s HR Panel and my MetroAir e-mail account. There are a total of six tools on my toolbar and the same is true for Tim and Matt as well. You can see the panel outlined below with all of the different tools. The first page Iâ€™d like to show you is the PiREP Management page. Every PiREP filed by a Washington pilot shows up on this page before itâ€™s approved, however, I donâ€™t approve them all. I only look at the Mainline Washington flights. The red Regional Washington flights are the Allegius flights and they are approved by Matt Reichelderfer. On Mattâ€™s page he sees both Regional Washington and Regional Ontario flights. Tim Moskal sees Mainline Ontario and Regional Ontario. To view a PiREP I click on the PiREP number and it opens a new page where I can see everything I could possibly want to know about the flight. The flight number, departure time and aircraft is at the top and the pilotâ€™s information is in the second box. When pilots use ACARS I can see the route they used along with the aircraft used and if I click on â€œACARS FLIGHTâ€ I can view even more information about the flight; speed, altitude, heading, location. â€“ everything that ACARS tracks in an excel spreadsheet. I pay close attention to fuel loads andÂ in this case the pilot did a wonderful job. I can see that his flight hours (2.7) is a little less than the 3.5 but with the ACARS data I confirmed that this is accurate. I see that the flight is online which I will show you how I verify in a second. My favorite part of the PiREP is the Pilot Notes section and I can assure you that we all read them. Itâ€™s a good way to clarify any abnormalities in the PiREP, delays, extra fuelâ€¦ or anything that happened on the flight. Some people tell us about the weather, some people make up stories about passengers, some people comment on how stupid AI Traffic can beâ€¦ Theyâ€™re fun to read because itâ€™s much more interesting than all the other numbers. 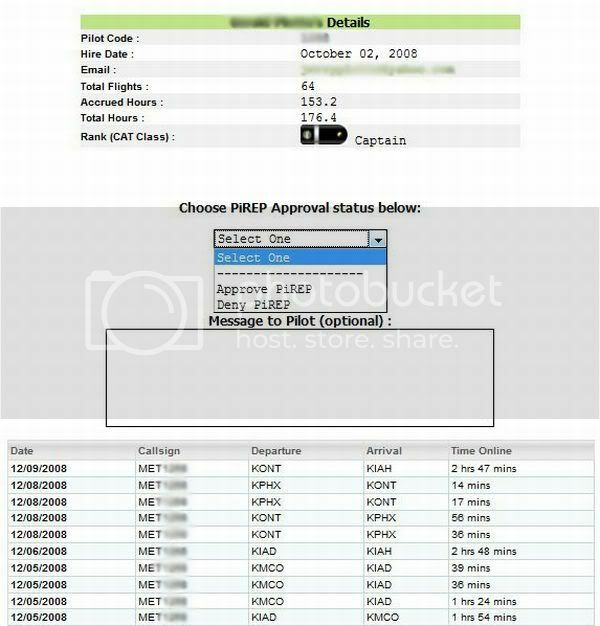 As we scroll down the PiREP page I get the pilots information, which I have conveniently blurred out for your viewing pleasure . I also have a place to respond to pilots about the PiREP with comments about the flight or any important information that they need. Below that I have a list of the pilotâ€™s recent VATSIM flights. I also have a drop down menu to either Approve or Deny the PiREP. Another important button that I have is the Pilot Management page. 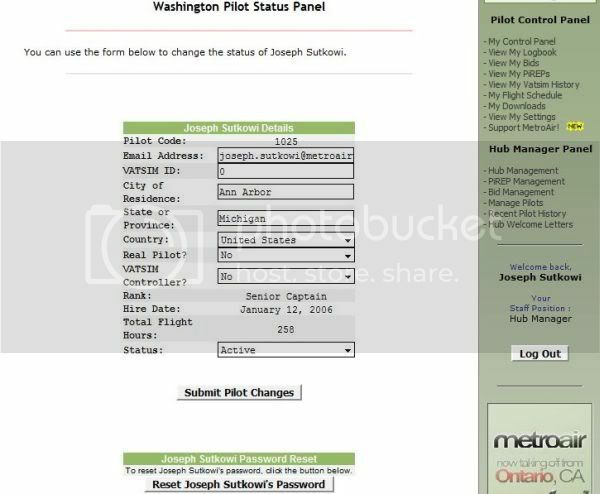 It gives me a list of all the Washington Pilots (regional and mainline) and looks similar to the pilot roster on the main hub page. When I click on it I get all of a pilotâ€™s important information. Iâ€™ve brought up mine so you can see it. The main thing that I do on this page is reset passwords when pilots forget them and also I can put somebody on Leave of Absence with the status drop down. I also have a page that lists pilot promotions, new hires, hub transfers and terminations. This is how we make the welcome posts and the promotion posts. The next stop on our tour of my virtual office is my e-mail account. The MetroAir e-mails are setup through Google and Iâ€™ve developed a system to organize the dozens of e-mails that I get each day. 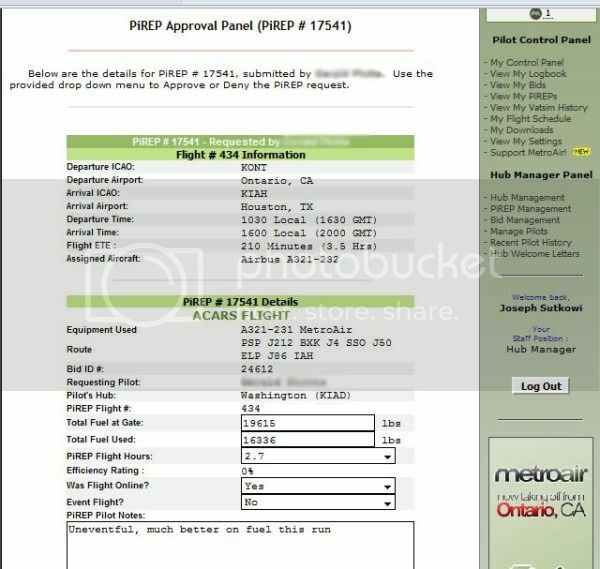 I get an approval message for each PiREP that is approved or denied , the same one that the pilot gets when his PiREP is approved. The only difference between the messages to me and the ones to you is that I get one for every PiREP at every hub and Iâ€™ve been etting them since I began in June. As of 2:36 PM on Wednesday, December 10th I have received 3,867 PiREPs. (Good work guys). They are automatically marked as read and labeled with the green PiREP Approval label. Any non-automated message is starred and the star means that it is something that I have to still take care of. Matt and Tim both have different systems that they use to keep the e-mails organized. By using the labels and star system I make sure that I donâ€™t miss any e-mails which could be easy when I get almost 900 a month (30 a day). I get a lot of e-mails from pilots and you guys have asked me a lot of different things. Iâ€™ve been asked for help with fuel loads, FPS problems, debugging. 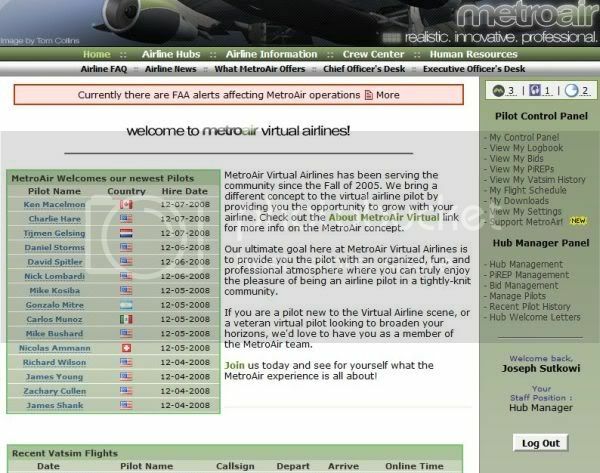 Iâ€™ve had questions about MetroAir policies, LOA requests and questions about our flights. I get a lot of questions and itâ€™s always my pleasure to answer them. I, along with Tim and Matt, am here to work with you and we will do whatever we can to make sure that you enjoy flying for MetroAir.